Conquer corrosion. Lubricate & protect with Jet-Lube anti-seize. Galling and seizing setbacks can bring business to a halt. Stop rust and corrosion before they begin, and protect your fasteners, connectors and components with Jet-Lube anti-seize, lubricants, sealants and more. 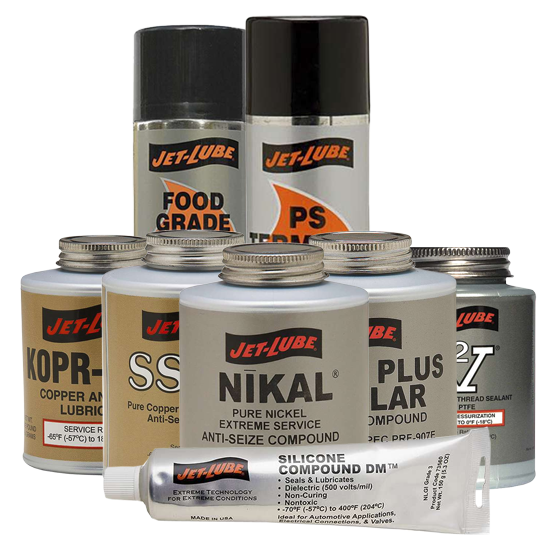 An industry leader for more than 60 years, Jet-Lube designs premium formulas that are uniquely engineered to deter damage in harsh environments and demanding applications. Low-friction and environmentally sound, Kopr-Kote is ideally suited for threaded connections, pump housings, flanges, studs and other industrial applications. Ideal for use with steel, aluminum, copper, brass and other alloys, 550 Extreme offers exceptional protection against rust, wear, seizure and heat freeze. A non-melting, non-volatile base grease, SS-30 is a conductive compound engineered to protect against seizures, galling and heat freeze while providing hydraulic efficiency. Engineered for use in extreme conditions, Nikal protects against rust from water penetration or wash-off while ensuring hydraulic efficiency. Nikal may be used where copper products are prohibited. Comprised of micro-sized aluminum components with extreme-pressure, anti-wear attributes, Silver Plus was designed to protect threads against corrosion, seizing and galling. A dielectric, translucent paste and sealant with excellent lubricating properties, Silicone Compound DM offers exceptional insulation and protection for electrical connectors. Highly water-resistant with low volatility, MP Silicone is a premium grease designed for use with a range of elastomers and plastics, and offers exceptional insulation for electrical connectors and assemblies. Non-toxic and environmentally sound, this high-performing thread sealant is lead-free, soft-setting and easily applied/brushable, even at low temperatures. For use with a range of materials and applications. A thin, non-greasy film designed for excellent adhesion to metal surfaces, 769 Trigger Sprayer eliminates moisture and prevents corrosion, even in environments with elevated salt levels. Developed for use in food-related environments, Jet-Lube Food Grade Silcone offers safe, exceptional lubrication for processing equipment without melting, freezing or staining. Non-flammable and residue-free, PS Terminal penetrates and eliminates dirt, grease and contaminants. With a 35,000V dielectric strength, this formula is intended for all metals and most plastics.